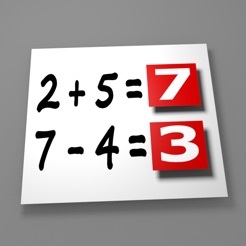 Camculator uses the video camera of your iPhone/iPad to solve simple math problems for you. Camculator can solve multiple math problems simultaneously in real time. By using advanced Optical Character Recognition, Camculator is able to recognize even some handwritten problems (*). It is also possible to solve math problems directly from a monitor or other display. Start the Camculator app and point your iPhone/iPad to an equation that you need solved or verified. When the problem is too small, just move the camera closer to the equation until it is recognized and solved. Use the pause button to pause the current picture when needed. Currently Camculator only supports the following mathematical operators: x, *, +, -, :, (, ) More operators will be added in future versions. Note that Camculator will not recognize ALL fonts and problems. It will do it’s best to read and solve your problems, but success is not guaranteed! A small white circle will be displayed at characters that can be parsed. A red circle will be displayed for all unknown characters.